“Dunsdale is the residence of Mr. Joseph Kitchin, and is situate close to the village of Westerham, in Kent. The house occupies a picturesque eminence, surrounded by pleasure grounds of moderate extent, which have been laid out by Mr. Milner, the landscape-gardener (late of the Crystal Palace). A small portion of a former house is incorporated with the new building. The accommodation is as usually provided and disposed in a gentleman’s house of the size. The walls are built of local stone, dressings included, except a few blocks of Caen stone for carving. The square tower marks the entrance, which happens to be on the quarter most removed from the line of approach ; the drive having, in fact, to pass almost entirely round the house. In accordance with this circumstance, if not also in pursuance of a sound abstract rule, all faces of the building are equally carefully designed and well finished. The architect says a good house is like a good square of infantry : it looks you full in the face all round. The builder was Mr. Myers, of London : the architect, Professor Kerr. The entrance doorway is placed on the ground story of the square tower, and is formed of Caen stone. The arrangement of design is of the simplest kind, and the effect is left wholly to the art of the carver. Natural foliage supplies the subject throughout; and,being delicately executed, produces a pleasing effect. 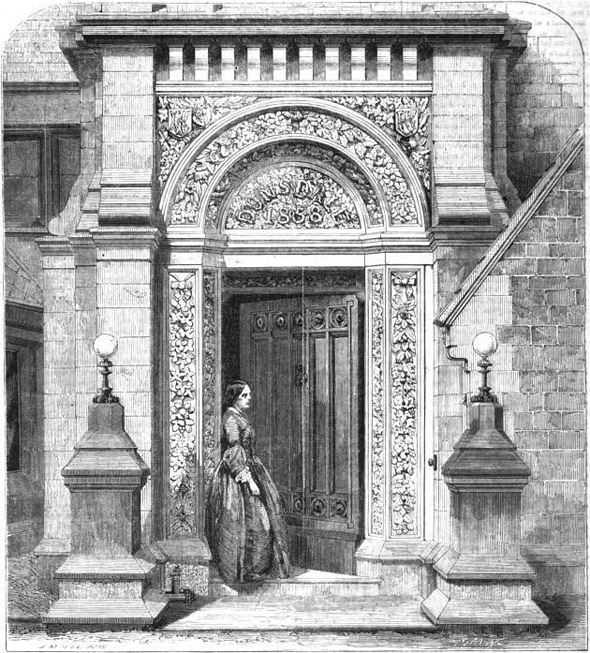 A massive oak door (in fact, a good old bit of carpenter’s Gothic, stripped and re-dressed) completes the design.” From The Builder, June 20 1863.